Every day, Neste does more with less. As we continue to pioneer the oil industry, we keep on rethinking conventional models. We make the most of existing resources and search out new, low-carbon feedstocks from materials like waste and residues. We are already the world’s largest producer of renewable diesel and we are seeing interesting growth opportunities also outside the fuel market. Neste Oil committed itself to adopting advanced technologies many years ago and has a long track record in developing lower-emissions traffic fuels. Neste Oil was the first company to offer unleaded and sulfur-free fuels, as well as biofuels, on the Finnish market. Today, Neste Oil produces the world’s cleanest diesel fuel from renewables and is researching a range of new raw materials. Neste Oil’s engineering expertise is also world-class. The dynamism of Neste Oil’s research and technology activities is based on in-depth know-how, close cooperation between the best people in their fields, and successful partnerships with research institutions and companies. Research and technology operations are based at Porvoo, where close to 1,000 people are employed in work related to R&D and engineering. Having the Porvoo refinery, the Technology Center and its laboratories, and engineering expert, Neste Jacobs, close to each other helps promote collaborative work and creates an innovative environment for world-class R&D. A major part of Neste Oil's annual R&D investments goes to research into renewable raw materials and refining technologies for processing these materials, and accounts for around 70% of overall R&T expenditure. Neste Oil is involved in research in both completely new raw materials – such as microbes, algae, and wood-based biomass – and existing alternatives – such as waste fat from fish processing industry. The company selects the focus of its raw material research based on availability, price, and sustainability. Neste Oil’s R&D has concentrated on developing products and technologies with a smaller environment footprint for decades. Technologies developed by Neste Oil, such as NEXBTL, NEXERTHERS, and NExOCTANE, embody a high level of technical and environmental know-how. NEXBTL renewable diesel, for example, is the outcome of an intensive R&D effort and is the world’s cleanest diesel fuel produced from renewable inputs. Neste Oil owns 60% of Neste Jacobs, an engineering company that off ers technology, design, and project management services and solutions to customers in the oil and gas, petrochemicals, chemicals, and biotechnology sectors in Europe, North America, and the Middle East. Neste Oil’s business is based on two business areas: Oil Products and Renewables, and Oil Retail. Neste Oil has four reporting segments: Oil Products, Renewable Fuels, Oil Retail, and Others. The energy industry is facing some major changes. The amount of energy used by traffic and transport is growing as population numbers rise, while oil reserves are declining. Identifying new raw materials is challenging and the wide-scale adoption of new technologies will take time. The environment is already being pushed to its limits, and environmental legislation is being used to help mitigate the effects of climate change. The various changes under way around us represent both challenges and opportunities for Neste Oil. Our cleaner traffic strategy is focused on developing and producing premium-quality fuels that have a lower level of impact on the environment. The most important factor influencing the operating environment for renewable fuels is mandated renewable content in many countries, as they offer a clear route for increasing overall renewable energy usage in traffic and transport. Competition on the retail market continues to remain tough. The world’s average temperature is estimated as likely to rise by 1.1–6.4 °C this century*. This will result in higher sea levels, receding snow and ice cover, and an increase in storms and other extreme phenomena. Major action is required to mitigate global warming. One way of making an impact here is by reducing the greenhouse gas emissions released by traffic and transport. It is estimated that the world’s population will number some 9 billion people by 2050, about one-third more than today. Energy demand will continue to rise as population numbers increase. Nature is being pushed to its limits, and we need cleaner, more energy-efficient fuels if we are to be able to meet the growing demand for energy in traffic and transport as sustainably as possible. National mandates covering the use of renewable energy are being introduced in increasing numbers worldwide and are having a clear impact on the demand for biofuels. These fuels represent an essential tool for increasing the proportion of renewable energy used in traffic and transport. The new EU directive on renewable energy, for example, requires that renewables should account for at least 10% of the energy used in traffic and transport by 2020. As much as 96% of traffic fuels are produced from crude oil today, and oil reserves are distributed very unevenly around the world. Energy security could well become an increasingly critical economic and political question in the future; and we need new raw materials alongside oil to ensure a sufficient supply of energy. Oil reserves are steadily being depleted and exploration is being forced to shift to increasingly difficult locations. Renewable raw materials are needed to meet the growing demand for fuel. Finding new raw materials that can be produced sustainably and on an industrial scale is one of the biggest challenges facing the energy sector. Engine technology is developing all the time, and new fuel alternatives are being introduced. The large-scale adoption of these new technologies takes time, however. Electric cars, for example, are projected to become a major solution only by 2050. Liquid fuels are likely to be a major source of energy for meeting growing demand for many years to come. The popularity of diesel cars in Europe has been on the rise for years, and they account for as many as half of new registrations in some countries. Their share of sales was highest in 2007, remained virtually static in 2008, and declined in 2009. This was partly the result of a narrower price differential compared to gasoline in neutral taxation countries and the fact that fuel consumption in small gasoline-powered cars is now very low, which means that their lower purchase price compared to comparable diesel-powered versions tends to attract consumers more than lower fuel costs. In terms of the overall car pool, the proportion of diesel vehicles is set to grow for many years. Diesel cars have failed to achieve a significant market share in markets outside Europe, however, where their use has not been encouraged by tax incentives in the same way that it has been in many European countries. As consumer fuel prices are significantly lower in many countries outside Europe, the lower fuel consumption of diesel cars is not as attractive. Diesel demand is expected to start growing again in line with economic recovery, and as industrial output and transport volumes begin to rise again. Increasing attention has been given to electric cars as an alternative to fossil fuels. Politicians have come out prominently in support of these vehicles in some countries, such as Finland and the US. While they might play a growing role in the car pool and as a means of reducing greenhouse gas emissions especially in big cities, it will take some time before they have a significant impact. The price, weight and short service life can be considered as limitations for electric vehicles in comparison to traditional cars. The spread of completely electric cars is being held back also by their limitations in cold weather. In cold conditions the batteries need longer charging times and their capacity drops, which leads to reduced vehicle range. The wide-scale adoption of new technologies always takes time, however, and it is estimated that electric passenger cars will not account for a significant proportion of new vehicle sales before 2030. Trucks and buses will continue to rely nearly entirely on liquid fuels in the foreseeable future. Also airplanes will only be relying on liquid fuels. Unlike the spread of completely electric cars, the number of hybrid vehicles is likely to increase rapidly. Hybrid vehicles are powered by a combination of an electric motor and gasoline or diesel engine. Electric cars require new logistics systems to supply them with power, while hybrids can make use of existing service station networks. Over the medium term, hybrid cars are likely to have a larger impact than purely electric ones. Even though electric vehicles are often considered to be completely emission-free, this is only true for the vehicle itself, however. Electricity generation can produce high levels of emissions, particularly in the case of coal-fired plants. Therefore, in addition to the new logistics system also changes in the electricity generating structure are required in order to electric cars to take a larger share of the market. Greenhouse gas emissions from electric vehicles are often higher than those of vehicles running on renewable fuels. Electric vehicles are not economically viable as such. Political decision-making in areas such as taxation therefore will have a large impact on the market penetration of new vehicles. World demand for biodiesel stood at around 21 million tons in 2011. Demand is expected to grow steadily in 2012, as a result of rising levels of mandated content and growing demand for fossil diesel. 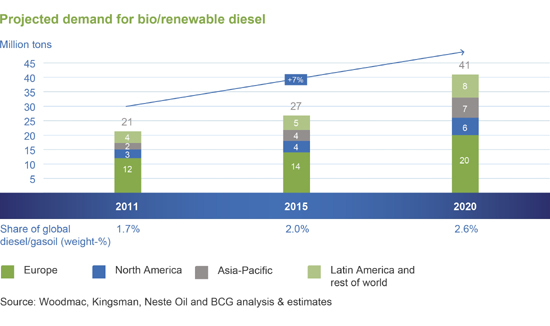 By 2020, the global market for biodiesel is projected to virtually double, to over 40 million t/a, of which Europe will probably account for around half. Biodiesel imports into Europe from Argentina and Southeast Asia in particular have grown significantly over the last three years. Legislation in the US, which will require 20% content by 2022. Similar legislation is also being developed elsewhere. Most, if not all of these initiatives also establish detailed requirements covering the quality of biofuels, emission reductions, and the sustainability of the production chain. A shift from financial incentives to mandated biofuel usage has been typical of recent years. As the volume of fuel used and produced has risen, sustainability criteria have assumed an increasing role in the legislative process. Neste Oil’s goal is to be the preferred partner for cleaner traffic fuel solutions.These solutions will be essential in helping meet the growing amount of energy needed in traffic and transport as sustainably as possible. By developing and producing low-emission fuels, Neste Oil can make a valuable contribution to combating climate change. In addition, Neste Oil’s R&D on renewable raw materials and refining technologies for these materials makes a valuable contribution to global efforts aimed at reducing the world's dependence on crude oil. Neste Oil’s long experience in developing cleaner fuels, together with its unique refining and technological expertise and sustainable business model, provide a small company in international oil industry terms with a solid foundation for implementing its strategy. Neste Oil’s strategy is founded on its unique ability to refine premium-quality fuels from a wide range of different, cost-effective feedstocks. Five Value Creation programs were established as part of the annual strategy review in 2011 and will be Neste Oil’s most important focal areas in terms of strategic implementation over the next few years. They are: Profitable Growth, Productivity, Renewable Feedstock, Customer Focus, and Winning Culture. A member of the Neste Executive Board is responsible for each program, and progress will be monitored regularly at meetings of the Neste Executive Board and the Board of Directors. The Profitable Growth program is designed to ensure that Neste Oil achieves its business targets in its selected growth areas of NExBTL renewable diesel, other renewable applications, base oil, and Oil Retail. The Productivity program is designed to deliver improved production efficiency at all of Neste Oil’s refineries by focusing on areas such as production structure, energy efficiency, and flexibility. The aim is also to enhance the efficiency of the overall production chain. The goal of the Renewable Feedstock program is to improve the availability and acceptability of the renewable raw materials currently used by Neste Oil and identify new, sustainably produced feedstocks for producing renewable fuels that are both technically suitable and generally acceptable. Working through the Customer Focus program, Neste Oil will aim to strengthen its customer-focused mindset and ensure that its expertise, processes, and tools match customers’ needs. The goal of the Winning Culture program is to create a company where it is safe to work and where people can constantly develop their capabilities. In addition, the aim is to create a strong culture of success, responsibility, and target-based operations within Neste Oil. Our mission is: Refining the future. Our strategy of focusing on clean traffic fuels is aimed at turning our mission into reality. 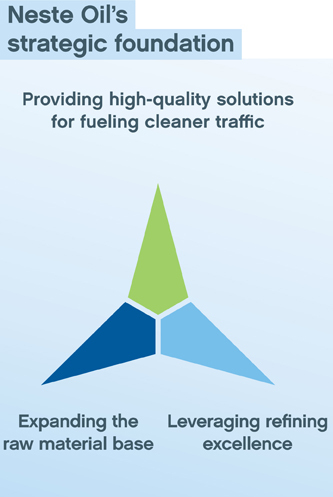 Our vision is to be the preferred partner for cleaner traffic fuel solutions. We are committed to striving to achieve this shared vision, and it is one that we believe we can attain. Neste Oil’s values are designed to guide both the company and the personnel in their everyday work. Neste Oil is a reliable employer and partner – a company that always lives up to all its commitments. We care about the well-being and safety of others, and ensure that our operations have the minimum possible negative impact on the natural environment and the surrounding community. We are committed to promoting the quality of people’s lives. In Neste Oil, we are familiar with each other and have a direct, honest, and open atmosphere. Our competitive edge is based on our ability to combine the wide-ranging experience and ideas of our people to create better solutions. This makes us an attractive partner for others. Our customers are among our most important partners. Understanding and anticipating the needs of our customers lies at the heart of our development and success. Neste Oil is an oil industry pioneer in refining and marketing cleaner traffic fuels. This calls for both expertise and an innovative mind-set. We are able to anticipate upcoming trends in our markets and businesses, and respond to them rapidly where needed. We invest in developing new products, new technologies, and new ways of doings things, and in developing the potential of our personnel. We encourage people to think in new ways, as doing so is essential to being a pioneer. Neste Oil wants to achieve world-class operational and financial performance that will lead us as one of the world’s best oil refiners. Working safely at all times is essential to achieving this goal. We set ourselves tough challenges, and we recognize people’s success when goals are met. Excellent performance is in everybody’s interest. Neste Oil is a young company with a long history and six decades of oil expertise behind it. Today’s Neste Oil successfully combines this solid industry experience with the business and environmental demands of the 21st century. Neste Oil’s predecessor, Neste, was founded 9th January 1948 to secure Finland’s oil supply, and began operations with a tanker bearing the same name. Products were stored at the Tupavuori facility at Naantali. The question of building an oil refinery in Finland had first emerged around the mid-1940s, and the formal decision to build one, at Naantali, was taken by the Finnish Parliament in December 1954 after many years of discussion. The new refinery was commissioned in July 1957, and in 1962 its capacity was increased from 800,000 t/a to 2.5 million t/a. The extended refinery soon proved unable to meet the growing demand for petroleum products in Finland, however, and it was decided to build a second one. This was commissioned at Porvoo in 1965. In the years that followed, Neste’s refining capacity, particularly at Porvoo, steadily grew, as did the range of the company’s business interests. Natural gas, exploration and production, and chemicals joined its core refining and shipping activities. Neste also established itself as a retail service station brand. Today’s Neste Oil is a refining and marketing company focused on premium-quality traffic fuels, and with a strategic target to be the world's leading supplier of lower-emission traffic fuels. Some 5,000 people work for the company, which operates in 15 countries.